Steve Andreas along with his wife, Connirae, are innovators, developers, and exponents of Neuro-Linguistic-Programming, (NLP), which was initially influenced heavily by the work of Milton Erickson. In contrast to Erickson's work which is obscure and full of mystery which makes it hard to learn or replicate, Andreas' work is very transparent and learnable. The Andreas have produced many resources with step by step protocols to create sustainable change and resolve specific problems such as PTSD, phobias, grief and resentment. The content of a memory is simply the story of what happened. The structure relates to how we are representing the memory in consciousness. For example: some will "see a picture," others will "hear the sounds and dialogue," others will "just have a sense or feeling about what happened" and some may also have "tastes and smells" associated to the memory. Within the visual, auditory, and kinesthetic modes of representation, memories may also have submodality aspects such as: size, intensity, color, and location. For example a person's "picture" of a person they care about may seem to be "closer" than the picture of a person they don't care about. Older memories when visualized are likely to be small and blurred in contrast to more recent visual memories. In contrast old visual memories of unresolved trauma are likely to be large and colorful and much closer to the person. When we "resolve" a past memory we cannot change the content of the experience, for that would be to create a delusion. We could change the perspective from which the past is viewed, for example from the perspective of a victim or a survivor. Or we can change the structure of the memory. We can change the size of pictures or the loudness of sounds. We can also change the location of pictures or sounds in consciousness, and any other aspect of the way it is represented. What people find is that changing the structure of experience is a way to create fast and sustainable resolution of problems. Surprisingly these changes can be created without any reference to the content of the experience. 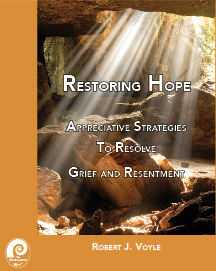 Rob Voyle's book Restoring Hope: Appreciative Strategies to Resolve and Grief and Resentment relies heavily on Steve and Connirae's grief and forgiveness processes which rely on restructuring the experience of grief and resentment. None of us is entirely committed to anything. We have competing demands on our time and actions. We may also have competing values such as a desire for freedom and a desire to belong. Whenever we make a change some part of us is likely to object. 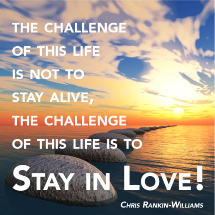 One strategy to deal with the objection is to ignore or overcome it. Unfortunately overcoming an object is a violent assault on our psyche and is likely to elicit a violent or passive aggressive response that sabotages the outcome. Rather than overcome the objection we need to seek it out and intentionally satisfy the objection. For example when a person is moving across country for a new job some part of them may object to the change because they will lose their friends or family. Satisfying that objection may include committing to a "trip back" once a year to be with friends and ensuring that the house they purchase in the new location has a guest bedroom where friends can come and stay. Changes that violate the Golden Rule are also not likely to be sustainable as they will often evoke a hostile response from the environment. Ensuring that no one is deprived of what is life-giving to them as we pursue what is life-giving to us is critical to creating just and sustainable outcomes. Steve Andreas recently wrote a blog on some of the specifics of the process that may be helpful. Steve's blog can be found at: http://realpeoplepress.com/blog/. The so-called "gold standard" for treating PTSD is "exposure therapy" in which the client is asked to re-experience a terrifying traumatic memory repeatedly. This is very uncomfortable, so there is a huge dropout rate, and it is also very undependable and slow, taking many sessions. Besides the dropouts, some people get worse, not better. If exposure alone worked, then someone with a phobia, who is exposed to it repeatedly, would soon get over it. So exposure alone is not a cure; there must be something else. Virginia Satir often asked clients to "see a troubling memory with new eyes," a metaphor that at least some clients were able to utilize successfully in the context of her nonverbally evocative presence and watchful eyes. But Virginia also taught a much more detailed process for resolving troubling memories, called "Family Reconstruction," a process she utilized in groups. After gathering some information about a client’s family members and their disturbed patters of interaction, she would ask them to select someone in the group to role-play each family member. Then she would use physical postures, gestures and sounds to paint a vivid picture of how they interacted. Sometimes Virginia would use ropes and other props to show how family members were tied to each other by their patterns of interaction - and how miserable they all were. A key element in this process was that the client also chose someone to play herself in this reenactment, so she could see herself, and her own misery in the context of the tableau that Virginia orchestrated. This was an elaborate way to create a very moving new set of images with the client as an outside observer. Those who have any familiarity with the NLP phobia cure will recognize this as a way to re-view a past memory as a distant observer. In contrast, exposure therapy instructs the client to re-experience the troubling memory as a participant, as if it were happening again in the present - which is what they are already doing if they experience "flashbacks." This process has an even older history. For thousands of years, many meditations have taught a similar process of "stepping back" and observing thoughts as if they are separate. Some people are able to successfully use the instruction to "step back" in order to re-experience a troubling memory as unreal, and therefore no longer troubling. But for many others this instruction alone will be inadequate to actually achieve an objective viewpoint, for a number of possible reasons. One step back may not be nearly enough. A client may need to take ten steps - or two hundred - in order to create sufficient distance to view a disturbing memory objectively. Even at two hundred steps, a client may need to shrink a troubling image to make it small, flat, dim, or black and white - or all of these - before being able to view it without being distressed or compulsed. To be really effective, the client needs to be at sufficient distance that they can see themselves responding to the troublesome event, not just the troubling event. When a client sees an image of himself freaking out "over there," that implies that he doesn’t have to feel those feelings himself. People suffering from traumatic memories often speak of feeling "frozen in time" because they have an unchanging still image of the traumatic event at the peak of their terror. Even if they are able to step back and view it at a distance, they may still have that static troubling image. If they remember a point in time that is still disturbing, you can ask them to make that still image into a movie, and continue the movie until later, when the terror is over and they are safe, so that they are not left with an image that is still troubling. When a client is already experiencing overwhelming feelings, it can be very difficult or impossible for them to take an objective point of view because of their emotional arousal. However, if they are first distracted, and then asked to imagine sitting in a movie theater before playing a movie of the disturbing memory, they will usually be able to. The many unspoken implications of a movie theater - that the movie is only a record on film or video of what happened in the past, some of which may have been achieved through makeup, special effects or other fakery, etc. - are far more effective in conveying the message "This is not real" than simply asking someone to verbally relabel it. Asking the client to notice the heavy curtains and the ornate decorations on the theater walls, the spring-loaded seats as they sit down in the theater, and to feel the arms of the chair they are sitting in, adds sensory detail that will strengthen the experience of actually being in the theater, and all the implications of that. The impact of these implications is an example of the importance of "what you know, but you don’t know that you know," often pointed out by Milton Erickson. But even all that may not be enough; the client may need to float up into the projection booth of the theater and look down at himself sitting in the audience in order to achieve sufficient separation from the troubling experience that will be displayed on the movie screen. Asking the client to reach out and place her hands on the plexiglass in the front of the projection booth concretizes the separation from the events on the movie screen, making it even more difficult for her to "fall back into" the terrifying feelings being felt by that woman on the movie screen. It also occupies the kinesthetic system with feeling the plexiglass, making it less likely that there will be sufficient remaining "bandwidth" in the kinesthetic modality for feeling terror. All these elements and more have been built into a detailed protocol that has been the core of the NLP phobia process since the late 1970’s, and which is the process of choice for what I call the phobic core of PTSD. 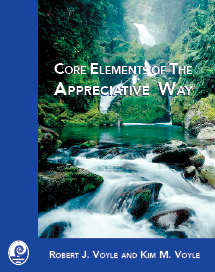 This protocol takes the simple conscious mind instruction to "step back" from a problem memory and "see it with new eyes" into an experience of doing it that elicits unconscious responses through implication. However, what is called PTSD usually includes many other difficulties in addition to the phobic core experience, and each of these requires a different intervention. In an earlier blog post I described many of these, which were included in a thorough and comprehensive four-day training in August, 2013. That entire 15 hours of explicit and detailed video, including written introductions to each segment and handouts, is now available in streaming video as The PTSD Training: Resolving PTSD and its Many Aspects. When you buy access to this set of videos, you can watch as often as you wish, when you wish, without having to clog your computer by downloading huge files-at a cost that is half the cost of the live workshop-never mind the cost of travel, accommodations, and lost income! See a sample video from this training here. A companion video streaming site offers you the complete treatment (four sessions totaling over nine hours) of an Iraq Vet in April and May 2013, including written introductions to each segment, and follow-up. For a full information and sample video from this site, go to ReleasingPTSD.com.